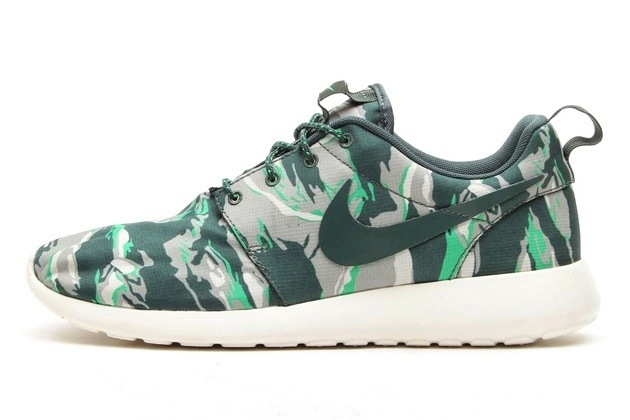 Nike‘s Roshe Run silhouette is set to hit Nike Sportswear accounts with an all-over tiger camo pattern, seen here in this predominately green colorway. The vintage green/vintage green-sail-gamma green iteration of the shoe boasts a familiar tiger-stripe camo pattern throughout the nylon upper while matching rope laces and a padded mesh collar are paired with a contrasting white sole. The “Green Tiger Camo” Roshe Run is now available for pre-order online, with a proper release expected at Nike retailers across the globe in the near future.